Spectrum Surgical is pleased to offer their complete line of veterinary dental instruments and surgery packs to meet the needs of veterinary hospitals. 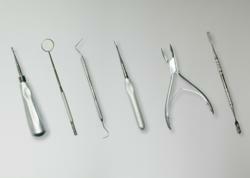 Spectrum Surgical is pleased to offer their complete line of Veterinary Dental Instruments. Spectrum’s full line includes all popular patterns, from dental mirrors, probe/explorers, scalers, root-tip picks, dental rongeurs, and elevators. Spectrum’s line of luxating elevators includes their popular Wing-Tip elevators and small-handled elevators, which range from sizes as small as 1.3mm in width, making them perfect for feline application or removal of very delicate fragments. Spectrum’s veterinary dental instruments are ideal for every pack. Complete kits including all sizes are available at discounted pricing. For more veterinary dental instrument information, please contact a Spectrum Customer Care Representative at 800-444-5644.